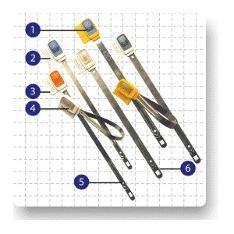 Domino is a fixed length, metal strap security seal. Its unique clear inspection window, allows quick visual inspection of the locking mechanism to verify integrity. Typically used to seal trailers, rail cars, containers, refineries etc. Marked on corrosion proof plastic head. Permanent bonding of locking head to strap using ultrasonic welding. Markings are clearly legible after long term application..
Welds cannot be forced open without clear evidence. Easy inspection of correct application. Withstands harsh environments and long term use. Custom laser printing available with name/code and number.